Introduction – Welcome to Fit Past 40! New Year’s is always a time of new resolutions. New beginnings. New opportunities. With the fresh year and bright hope, many of us vow to lose weight, start exercising, spend more time with family, get longstanding projects complete, and so forth. For a couple years now, I have contemplated writing a column or blog to share my inside tips, thoughts, and suggestions on staying fit and living healthier. I have had this growing feeling as many people often come up to me and either ask me how I stay so trim or ask if I am a trainer. The surprise factor is when they also find out my age; they are typically stunned as they have thought I was many years younger than I actually am. So what’s my secret? How do I do it? “Please tell,” I’m asked. Well, now I will. Each week I will post a new blog. I already have numerous topics in mind: Cardio, Yoga, Pilates, Weight Training, Hydration, Vitamins, Super Foods, Meals, Snacking, Sleep, Skin care, and many more, and how all of these combine play a role in your overall wellness and fitness. But first, let me tell you a little more about myself. I am the youngest of three, with the elder two being brothers. One is a now physician and the other recently stepped down as a CEO to become a partner in an executive firm. Our mother was before her time in the sense that she was extremely interested in vitamins, foods and herbal supplements. The right side of our refrigerator was filled with bottles of A,Bs, Cs, and all sorts of supplements. She made very healthy meals, kept little or no sweets in the house, and made sure we took our daily vitamins. 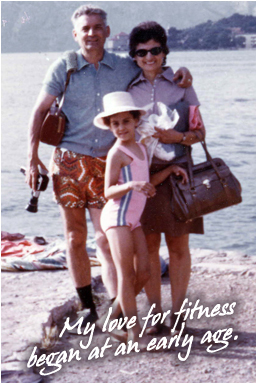 Dad loved eating right, having a glass of red wine with his dinner, and keeping fit. He walked 5-10 miles every day as well as performed the old-fashion calisthenics. I grew up tagging behind my big brothers – climbing trees; running in flag football and flashlight tag; swinging bats and racquets; reaching for and throwing balls; riding bikes and skateboards; roller and ice skating. In my early years, I played any sport activity that was made available to me, including gymnastics, softball, track, tennis, and riding horses. In school, I played field hockey, lacrosse, and, for a few years, played in four basketball leagues. In college, I just played lacrosse, but I additionally ran, swam, and worked out in the weight room to make me a stronger athlete and player. My passion for fitness has continued ever since. Over the past ten years or so, I have competed in fitness competitions, running events, bike tour rides, and triathlons. This is all supplemented to various aerobic classes and strength training, and not to mention still participating in other physical endeavors including tennis, racquetball, skiing, swimming, riding horses, and golf. Actually, I will participate in almost any sport activity that is made available to me as I still love to play. At 46, I am as fit, healthy and strong as another woman half my age. Besides the exercising, I take good care of myself. I have a healthy daily diet, get plenty of rest, take good care of my skin and hair, and aim for a balanced life with less stress. How I achieve and maintain all of this to keep me young-looking, healthy and fit will be forthcoming in my weekly blogs to come. So I hope you return and bookmark this page. Tell your friends about the blog. I look forward to sharing with you my tricks and tidbits. And if you have something to share, please feel free to pass it along to all of us trying to live a healthier life.